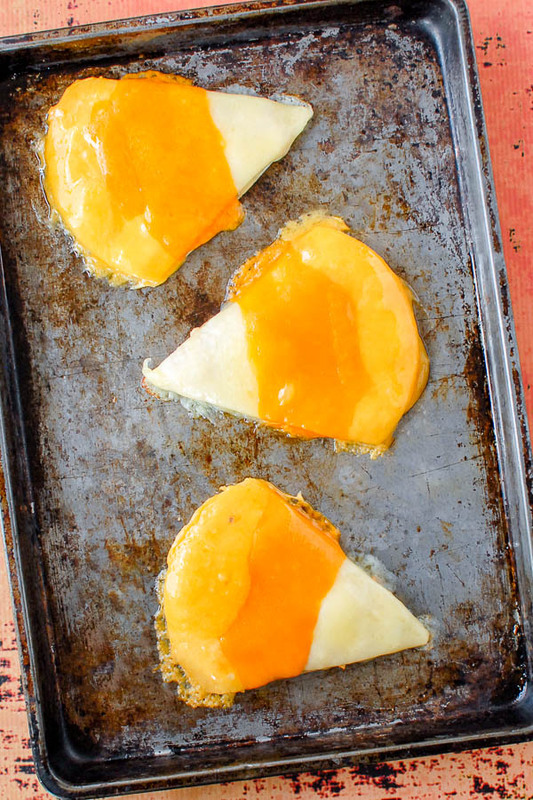 Chicken Quesadillas are tranformed with the right cheese on the outside to create Candy Corn Chicken Quesadillas, a healthy Halloween recipe! Ok, ok, I realize it’s still September. I’m having a bit of difficulty holding back from one of my favorite holiday seasons; Halloween. There are many things I love about Halloween. The whimsy of it. The chance to dress up, which I do every year. The fun, more rustic decorations, with so many homemade options. 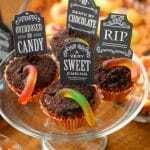 And the chance to come up with some spooky food! I promise I’m not going to feed you with a fire hose of ghoulish treats from now until October 31 but this idea popped to mind late last week and I could not stop myself from trying it, and then in seeing how cute (and delicious) it turned out, from sharing it with you! 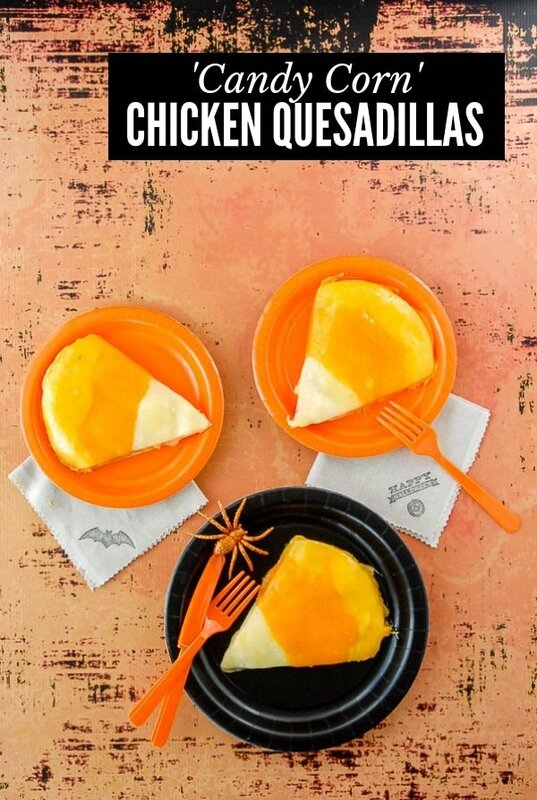 I think I horrified my 10 year old by declaring I was going to make Candy Corn Chicken Quesadillas. 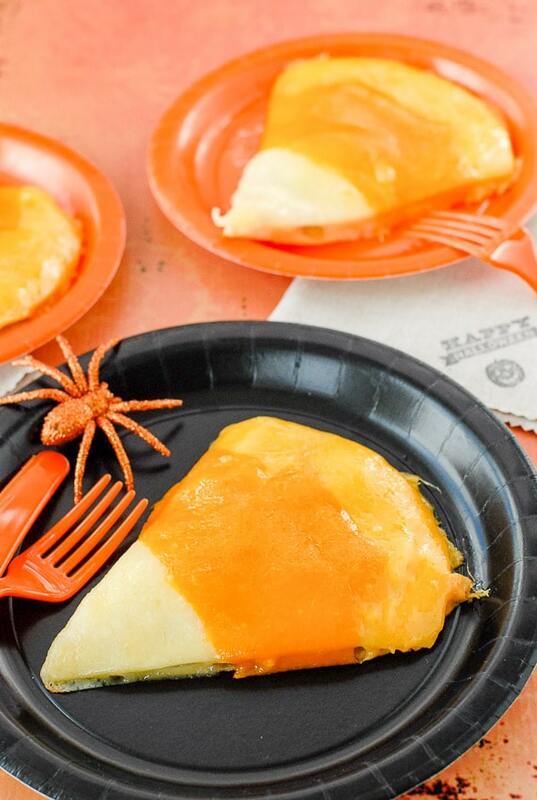 Before his gag reflex fully engaged I slipped in that no candy corn were harmed in the making of this recipe, it was just that the quesadillas LOOK like candy corn thanks to three different types of cheese. There are always so many sweet confections in October I love thinking up some more hearty, healthy options that are still playful. 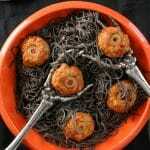 This is a fun quick dish anytime this month or including before Trick or Treating. The quesadilla is filled with roast chicken, your favorite salsa, sour cream and roasted green chilies. It’s a simple savory dish, with a bit of crafting in creating the cheese mosaic. Completely filling and delicious! 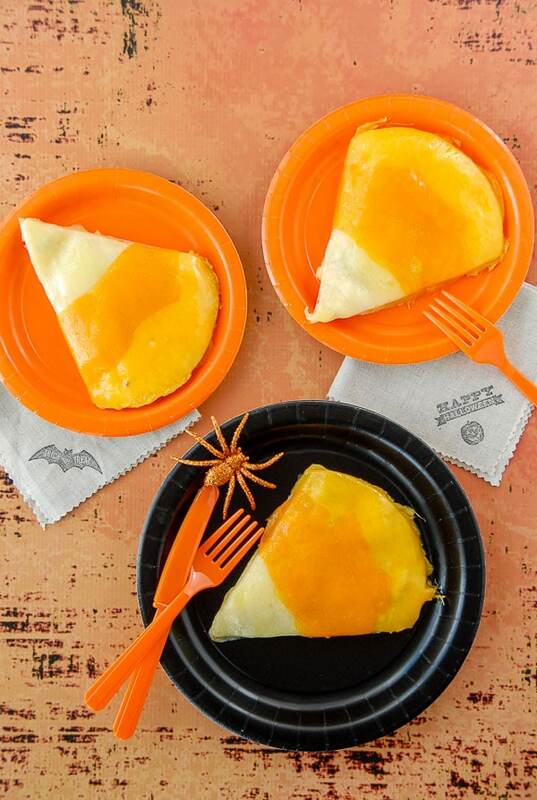 Simple, flavorful food made fun for Halloween! 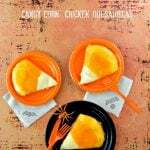 This filling chicken quesadilla is laced with salsa, sour cream and green chilies and topped with cheese in a candy corn pattern. 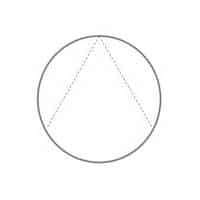 Cut the tortillas into a triangle, leaving the bottom uncut and round (see diagram). Cut them in pairs so they will match together. Place all tortillas in a sealed zipper plastic bag to prevent drying out. In a small bowl combine the salsa and sour cream; stir to mix. In a medium mixing bowl combine the chicken, green chilies and salsa/sour cream and stir to completely combine. Salt and pepper to taste. Place one side of a pair of cut tortillas on a large baking sheet. Spoon 1/3 cup of the chicken mixture onto the tortilla and evenly spread it over the tortilla. Place the corresponding tortilla on top of the chicken mixture. Repeat for all the tortillas to make 6 quesadillas. 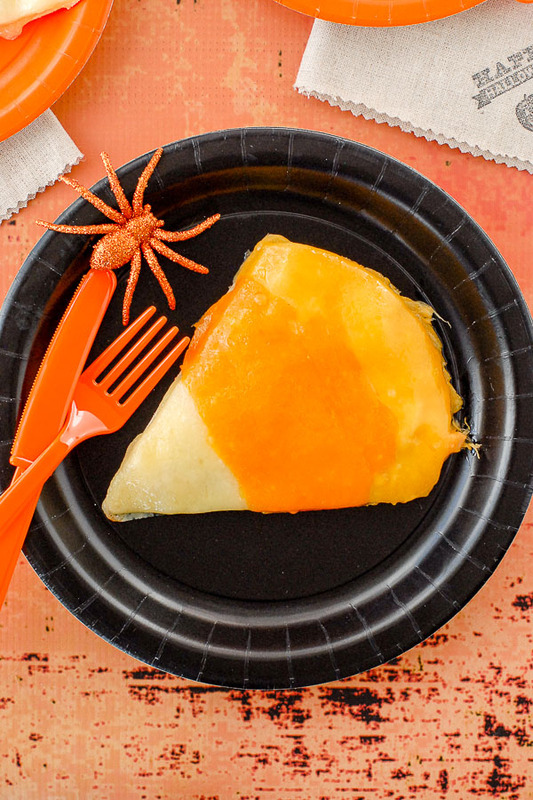 Using kitchen scissors or a sharp knife, cut the cheese to cover the top tortilla in a candy corn pattern: white for the tip, dark orange for the middle (the largest section) and light orange for the top. Cover the whole tortilla. Repeat for the remaining quesadillas. Place quesadillas in the oven. Bake until the cheese has totally melted but don’t over bake until the cheese is thin and runny (about 5 minutes). Remove from oven, trim any extra cheese if desired and serve. love the idea and took my oldest grandson and we “attempted” to make these for our family fall vacation! May not have looked like picture but were a hit! We had fun and were eaten so fast that we wondered if everyone liked them. Have been ask to do again very soon!!!!!!!!!! Grandson is 8 yrs old and likes to cook.. His uncle (my son) is a great chef himself. He got it all from me( ha , ha!!!!) Just blessed with a good mother who can cook anything!!!! Fantastic Mike! As long as you and your Grandson have fun (so he’ll want to keep experimenting in the kitchen) and they tasted good, that is all that matters. More cheese helps the melting into the solid stripes too. Sounds like you should be tinkering until you have them the way you want them to look; because of course you get to eat the rejects too! Thanks so much for your comment. So, so clever! These are great…and they sound delicious. Must make! Thanks Heather! They were really fun (and tasty too)! These are waaaaay cool!!! I LOVE IT! SO creative! What a fun idea, Toni! “No candy corn were harmed in the making of this recipe”… I’m laughing! So so pretty..I am trying t his out soon! 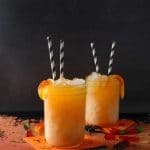 These are HYSTERICAL and perfect for the season! How creative! Thanks Mallory! I think my 10 year old was terrified by the title that I may have mixed actual candy corn with the chicken! ‘Not so’ for the record. So inventive – thank you. Love it. Thanks Liz! It popped to mind and I was so happy with how they turned out. They were gobbled up pretty quickly too! Thanks Yvette! I love them too (and they are tasty! ).